Explanation: Was Mars ever wet enough to support life? To help answer this question, NASA launched two rover missions to the red planet and landed them in regions that satellite images indicated might have been covered with water. 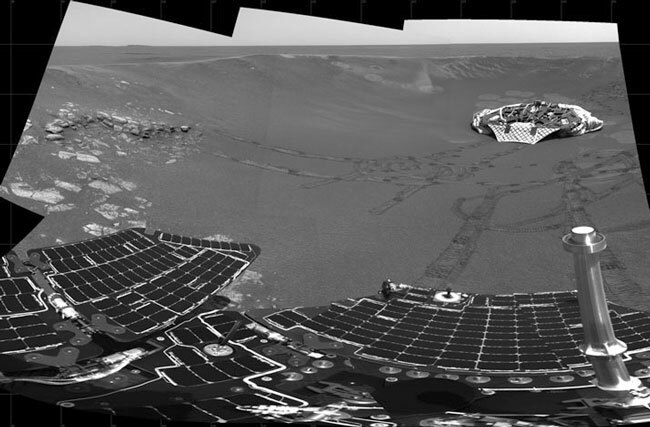 Yesterday, mounting evidence was released indicating that the Mars Opportunity rover had indeed uncovered indications that its landing site, Meridiani Planum, was once quite wet. Evidence that liquid water once flowed includes the physical appearance of many rocks, rocks with niches where crystals appear to have grown, and rocks with sulfates. Pictured above, Opportunity looks back on its now empty lander. Visible is some of the light rock outcropping that yielded water indications, as well as the rim of the small crater where Opportunity landed. The rover will continue to explore its surroundings and try to determine the nature and extent that water molded the region.